Counterfeit tech carries significantly higher consequences than a fake Rolex or a hastily copied handbag. Hapless individuals and business owners can find themselves stuck with tens of thousands of dollars of useless fakes pawned off as the real thing. A phony app masquerading as the real deal can infect your business’s devices with malware, opening the door for even more damage. And at the very worst, counterfeit products have been implicated in serious injuries and even deaths, such as when poorly made fake power adapters electrocuted several iPhone users. As counterfeits grow increasingly sophisticated—and increasingly brazen—it’s harder for even sharp-eyed buyers to differentiate an authentic product from a fake. Here’s how to tell a legitimate product from a phony one, in five of today’s most susceptible market segments. Counterfeits tend to follow the market, and lately they’ve been going mobile: Smartphones and tablets are becoming hot properties for fraudsters. Not surprisingly, iPads are increasingly common targets for counterfeiting. Street-vendor items, especially overseas, are almost always fakes, and eBay items that are priced to move are frequently scams. Even retailers are prone to acquiring and selling fake gear, often unknowingly: A scammer simply purchases an item from the retailer, unwraps it, replaces it with a fake, and then returns the imitation item to the store for a refund. Even if the retailer inspects the gear to avoid the old brick-in-a-box scam, the store remains none the wiser since the fake, on cursory inspection, looks legit. The ‘hiPhone 5’ (left), based on leaked images of Apple’s handset, hit the Chinese market before the real iPhone 5 did. It sold for as little as $31. Credibly counterfeiting a phone is very tough to do. Most users report that counterfeit versions of high-end phones and tablets are fairly easy to spot—once you have them in hand. For starters, the weight won’t seem right. (Use a postal scale if you want to check—an iPhone 5s, for example, weighs 3.95 ounces.) The case probably won’t be as seamless, and won’t feel the same as the real thing. And the buttons won’t have the right fit and finish, as on the real phone. Most fake phones may “work” in some form, meaning they have a rudimentary operating system and a few apps installed. These knockoffs aren’t built to emulate iOS or Android (generally they run some version of Linux), but are instead designed to pass muster with someone who takes only a quick glance at the device. A fake tablet will likely turn on, but you may find different icons than you expected, a blurry screen, and a number of apps that simply don’t do anything when you tap them. Most fakes remain shoddy. 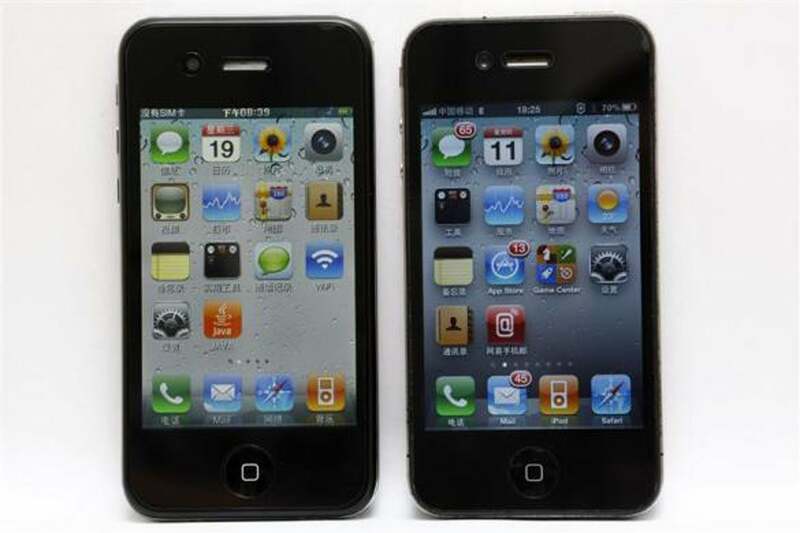 In 2009, the blog MacMedics offered an instructive in-depth look at a fake iPhone 3G that was purchased via eBay: While the box looked good, everything else was suspect. The included accessories were wrong (a spare battery and a stylus? ), the phone operated extremely slowly (and often not at all), and the screen was made from plastic instead of glass. The key is making sure to check out an item in person and to put it through its paces before you buy. Deep-discount eBay shoppers, be warned. Phony tech components such as microprocessors, RAM modules, and graphics cards are big business. Compared with mobile devices, they’re easier to fake and harder to spot, and since they’re often sold in bulk, they can rake in huge amounts of cash all at once. The problem extends beyond eBay. Even the respected e-commerce site Newegg had trouble when it inadvertently sold several hundred fake Intel Core i7 chips in 2010. The “processors” turned out to be just pieces of plastic and metal packed into a fake box littered with misspelled words. Consumers were justifiably irate. While some fake components may be nothing more than paper clips and clay, others are more sophisticated. Scammers may repaint and relabel real, operational products as something different—a dirty seller could stencil a new product number onto a $100 low-end CPU and flip it for $500. Unscrupulous sellers might also pawn off used or damaged products as new if they know that you won’t be testing them soon. For example, since an on-site buyer can’t easily test whether a RAM module works, the scammer has more time to get away with the crime. On any printed circuit board, check for a serial number. Some manufacturers will accept support calls to verify whether the number on the board is legit. (Boards without serial numbers should be considered suspect.) Products that have been repainted and relabeled can be hard to spot without lab-grade equipment, but one thing you can do with a tricky component such as a CPU is to search for the product name on Google and look for a high-resolution photo online. Compare the picture against the product you’re buying, looking for even the tiniest variation in component placement, color, or label markings. eBay offers some guidance on identifying phony CPUs, including side-by-side real/fake photo examples. Presumably, if you’re reading this, you’re interested in genuine, operational headphones. Many fakes in this area are painfully easy to spot—if you’re buying equipment on the street or without retail packaging, you might want to think again—but some “headfauxnes” are more sophisticated. Be suspicious of a seller that offers a discount if you buy more than one pair of headphones. In addition, you should pay special attention to the packaging in this category. Don’t just look for typos on the box—make sure that the photos aren’t faded or smeared, and that the shrinkwrap is tight and professional. If you’re buying used, listen to the headphones first. And, as with smartphones, verifying the product’s weight can help you spot a fake. As software sales move from the store shelf to the cloud, this is mercifully one counterfeiting category that is slowly dying. That said, fake packaged software—particularly for high-end products—is still commonplace. It’s a major problem for companies such as Microsoft, which has undertaken great effort to ensure that you can tell, at a glance, whether a software disc is authentic. Look for the word ‘Microsoft’ changing into the word ‘Genuine’ on the outer rim of authentic Microsoft discs. Microsoft offers a guide to checking software disc validity. The company’s biggest tip is that a counterfeit product will undoubtedly fail online validation—but by that point it’s far too late for you, since the cash will have already exchanged hands. With high-end packaged software, checking for a valid certificate of authenticity is your best bet. Usually the certificate is a specially designed sticker or insert that, in the case of Microsoft products, has an interwoven security thread as well as holographic or color-shifting ink features. Generally discs will also feature holographic designs. The hologram should always be printed on the disc, not attached with a sticker. Consider those with no hologram to be suspect. For Microsoft products, one of the most difficult security features to fake can be found on the outer band of an optical disc: Look for the “Microsoft” label that changes into “Genuine” as you shift the disc in the light. Remember that secondhand discs, while they may be authentic, are likely to fail validation due to prior use. Microsoft changes its packaging and disc designs with regularity, so you’ll need to stay on top of what your specific product should look like. Microsoft offers sample photos online, and Google image searches can help in identifying genuine packaging as well. Physical-software counterfeiting may be on the decline, but mobile apps are a growing and far more hazardous counterfeiting target market. Counterfeit apps don’t just consist of those designed to get a quick buck from you in exchange for a nonfunctional product. Most of them are free, but are malware in disguise, making them both enticing and extremely dangerous. The Netflix app on the right looks legit, but it was actually designed to steal your login info. A common MO with counterfeit applications is to “Trojanize” them: Take a paid app, break it down and add malware, and then reoffer it online as a “free” version. A different approach among lazier scammers is to package up a link to the mobile version of a website (such as m.facebook.com) and offer it as a “mobile app,” littering it with extra ads to earn a quick buck. The more nefarious apps are commonly designed to send Premium SMS messages—texts that can cost up to $10 each time they’re sent. Spotting fakes can be tough. The first step is always to download apps from a trusted store—iTunes, Google Play, Amazon, or the Microsoft Store—but even these marketplaces aren’t immune to being compromised. Android users who frequent second-tier app stores should be especially careful: Many of these stores are perfectly legitimate, but you should make sure that they are well curated before purchasing software from them. No matter which store you use, practice common sense before downloading something. Watch for copycat names. For example, do a quick search for “Plants vs. Zombies” on any store, and you’ll find it littered with knockoffs, some of which are simple adware-strewn apps, and some of which are more malicious. Another classic, useful tip: Check the developer’s name on the app listing and match it up with that of the actual developer. If you see multiple apps with the same name and the developer trick is of no help, check the ratings and reviews for signs of trouble. Regardless of its rating, a popular app should have thousands of downloads. Most malware apps have just a fraction of that and often suffer from a slew of one-star reviews. Once an app is installed, spotting a fake becomes far more difficult. The fake Netflix app that Norton highlighted in an online article looks authentic, even though it’s made specifically to steal user login information. As an extra measure of security, Android users are also well advised to install a security app that can monitor the mobile device for dangerous behavior. Counterfeit electronics are a serious problem that is likely to get worse as fakes improve and as mobile malware becomes more insidious. Protecting yourself is largely a matter of taking a few commonsense precautions and heeding that old adage: If the price sounds too good to be true, it probably is.